This summer, I went to Vienna for some days, to meet up with abroad friends who happened to travel in Europe at almost the same time. Being German, the trip to Vienna itself was easy, language-wise: Austrians speak German with a dialect that isn't difficult to understand. While strolling through Vienna, I didn't feel like being too far abroad, and even the complex system of public transport was okay to navigate. 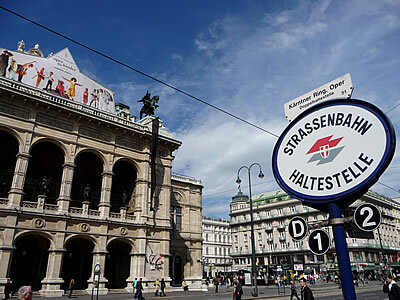 Here are some street scenes from Vienna with signs included, the first is "Strassenbahn Haltestelle Kärntner Ring, Oper" - "Tram Stop Kärntner Circle, Opera", right in front of the opera builiding. This is the "Dorotheum". It was strange to see my name like that. 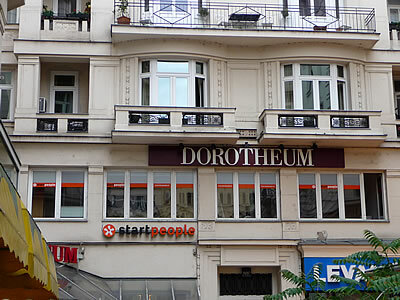 The Dorotheum is both an auction house and a pawnbroker. It dates back to 1707. 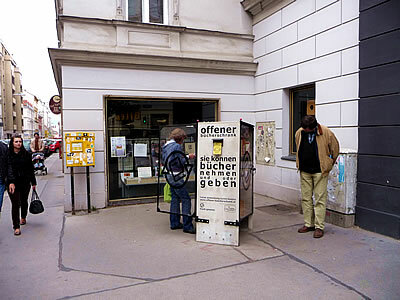 And here is something I hadn't seen before: a "offener bücherschrank" - "open book cupboard". The instruction for it are simple, and written on its side: "sie können bücher nehmen und oder geben" - you can take and or give books." Here's the website about it, it's in german, but with photos (scroll down..): offener bücherschrank. While in Vienna, we discovered that there is a special tourist ticket: 14 Euro for a day-ticket from Vienna to Bratislava and back. 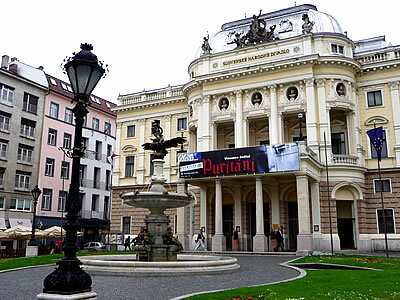 Bratislava is the capital of Slovakia, it's only about 60 kilometres (37 miles) from Vienna, which makes Bratislava and Vienna two of the closest European national capitals to each other. 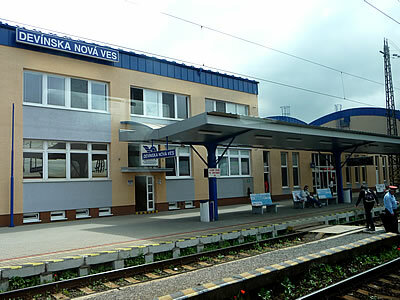 The first thing we saw of Slovakia was the border-crossing point "Devínska Nová Ves". As Slovakia belongs to the Schengen Zone, this was a regulart train stop, without passport checks. From there, it was just about 20 minutes to Bratislava. Once we arrived, we went looking for the tourist info at the train station. Somehow, we were sure that a tourist office that offers a special visitor's ticket to bring tourists from Vienna to Bratislava will also put up an office or help desk at Bratislava train station, to welcome arriving tourists and hand them the bits of information you need to get around: city map with the main sights, and some rough guidelines on how to get to the old town, which is the most scenic and interesting part of the city. Turned out, that yes, there was a tourist office once, but it moved.. to the old town. While the train station is located at the upper edge of the city. And good thing we had a map: when we asked for directions to the old town, the first person there spoke English, looked at the map, then gave us specific instructions which tram to take, and where to get out of the tram. The stop was named: "Laurinska". It's line 13. It takes you right from the train station to the old town and back. Still, the detour was a good thing. Taking the wrong tram gave us a clue to Bratislava city beyond its showcase centre, which greats visitors with impressive buildings, and streets full of galeries and cafés, yet feels a bit polished. 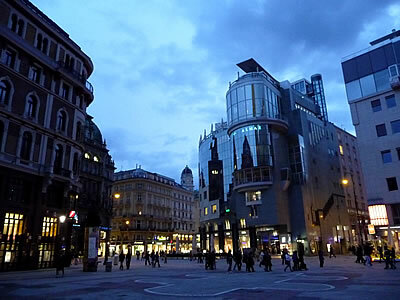 The first photo shows the opera, the second is the one of the city towers. 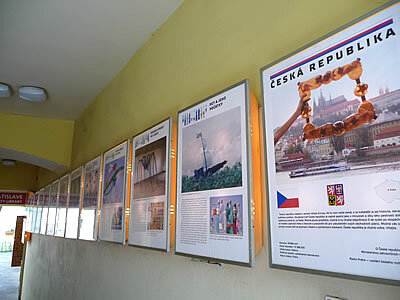 And here's a snapshot of the passge to Bratislava library, it hosts a photo exhibtion. The city in the large image is Prague, the capital of Ceska Republika, the "sister" state of Slovakia. Up to 1993, the two states were united, and formed Czechoslovakia. The day trip to Bratislava indeed felt like a trip through history, and the different language made it special, and more "abroad". On the way back home to Vienna, scenes from Bratislava kept playing in my mind, and I penned down some notes that later turned into a poem, just like the notes from the first day. Both poems got accepted by an international online journal that adds a third capital to the day trip: Istanbul Literary Review. Below, the poem from the first evening with a photo. base of this city, of any city? My gosh! 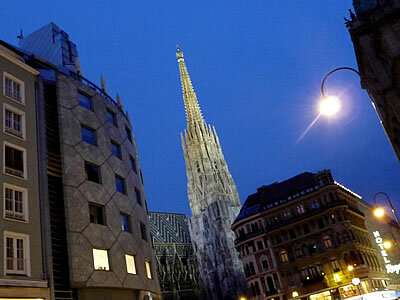 So interesting to see your photos of these places--some of which we saw together on our first night in Vienna. Thanks so much for posting. I have some wonderful photos of you in front of the Dorotheum signs. I'll have to dig them out over the holidays. Found this via Nicole. You have written about three of my favorite cities in the world, and during the 90s, I lived in Bratislava for almost seven years, and have been to Vienna more than a hundred times, Budapest a few. It was pleasant this hot morning in Argentina to get taken back to Central Europe. I have also lived in Berlin (2002 - 2006), and traveled extensively in virtually every country in Europe. 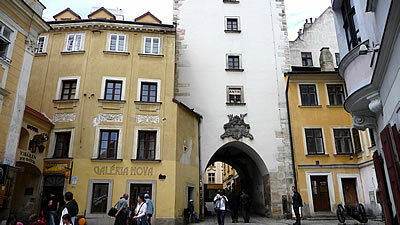 Given that, Bratislava remains one of my favorite cities ... if not the favorite city. Next time, stay a week or two; one day is rather like being offered a gourmet meal, bending over to get a whiff of it, then having it taken away. Nice photos. Wish there were more. Interesting tour. I especially like the poem. I take the curved route just about everywhere!